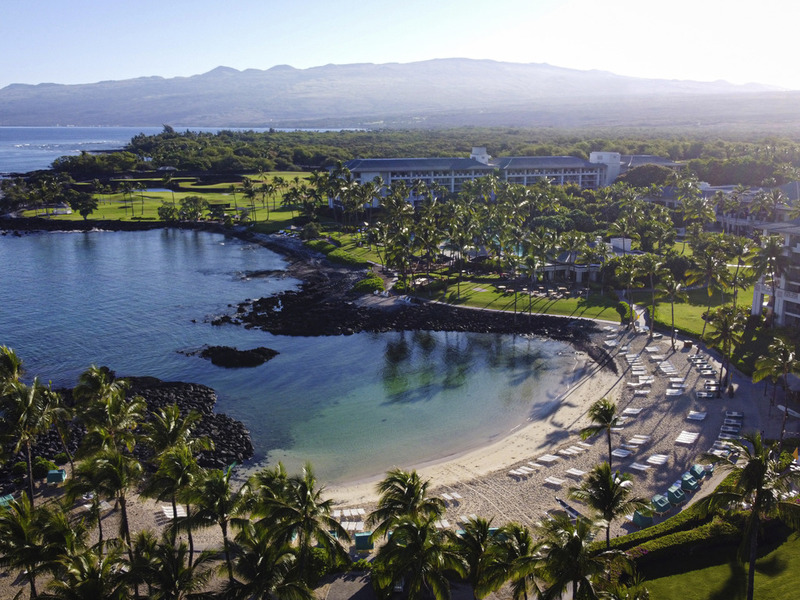 The Fairmont Orchid is a 32-acre tropical island paradise located beach front on the northwestern coast of the Big Island. Placed throughout the grounds there are courtyards, waterfalls and fountains to discover. You can relax on our sugar-white beach with crystal clear waters or explore the Polynesian culture of the island. Our accommodations on the Kohala Coast of the Big Island of Hawaii let you escape it all. Imagine waking up to the sound of waves crashing along the shoreline while you plan your day. Or waking to spectacular views of the nearby mountains. And dont forget evenings spent on your lanai overlooking the hotels gardens and waterfalls. Our Hawaii accommodations are luxurious and our views are unforgettable. The AAA Four Diamond award-winning Brown's Beach House is the place for a quintessential island fine dining experience located just steps from shore. Innovative, Hawaii Island inspired cuisine is drawn from simple, local, fresh flavors. With the warmth of Aloha, welcome to Hale Kai Restaurant. Days are spent enjoying time with the sea, sun and friends. Located poolside, Hale Kai is the perfect venue for a most refreshing lunch, afternoon sunset or evening dinner. Brown's Deli offers breakfast and lunch items delicatessen style with island flair to enjoy at outdoor tables or wander down to the beach. Norio's Japanese Steakhouse & Sushi Bar features indoor and outdoor seating, a traditional sushi bar and a private dining area. In addition to traditional sushi favorites, the menu features dry aged meats, sustainable Hawaiian and Pacific Seafood. Orchid Court serves the premiere breakfast on the island offering a sumptuous rotating buffet menu and a tempting selection of à la carte items perfect for the dawn patrol or late risers alike. Luana Lounge features tropical libations and perfect sunsets complemented by Big Island artists' creations. The lounge features indoor-outdoor seating areas, as well as an inner bar and lanai overlooking the grounds and the blue Pacific. This beachside bar features a Polynesian-style thatched roof, refreshing trade winds and sweeping views of Mauna Kea and the blue Pacific. A variety of tropical libations and mouth-watering pupu (appetizers) are served. The staff, grounds, and food were amazing. I couldn’t stand the squeaky mattresses, which woke up the room anytime someone got up or down and were a constant reminder that those beds had been slept in by hundreds of people. Yuck. Please invest in new mattresses. Also, some sort of alarm (telling everyone to clear the building) went off while we were there and terrified my young daughter to the point where she was in tears as she vacated our room with us. Not sure you could do anything about that, or if it was a real or false alarm, but it put a damper on the stay. This was my first time to Hawaii and it was unbelievable! Fairmont Orchid was amazing. The staff was so friendly and helpful, from maid surface to bartenders they were all great. The grounds were beautiful and immaculate. The Hotel made a choice to place portable toilets and a catering kitchen right outside our balcony. They also authorized a large party to play extremely loud music until 10pm which prevented us from sleeping. The Hotel knew that we would be extremely inconvenienced and didn't tell us when we checked in and did nothing to mitigate to inconvenience. They made an explicit choice top optimize for this large party at the expense of guests like us paying over $1,000 dollars a night. I assume they expected to lose my business permanently and decided that was worth it to accommodate this large party. I feel very badly that I actually chose to stay at this hotel. I can’t tell you how many times we have stayed at the Orchid. Every time we discuss a vacation, we always decide to go back. I have stayed at the Orchid several times over the years including decades ago when it was the Ritz Carlton. I have never been disappointed until now. The stay started off on a low note as soon as we arrived. Although we were the only car in the valet area and there were 2 people working behind the podium 4 feet away from us and they didn’t even look up. We opened our own doors and removed all of our luggage without a word from the valet. There was a problem with my reservation and the front desk insisted that I must have booked through a third party. I did in fact book directly with the Orchid. I had also booked a reservation for 3 for the luau. There wasn’t a reservation for us and I was directed to the concierge who also insisted I must of booked with an outside vender. She was able to get reservations for us. However, we were the last table at the very end of the luau. We were literally the last three people in the back row. It was hard to see anything. I had booked Alii seats when I made my reservation. The entire purpose of our visit was specifically to attend the luau which is only held on Saturday night. The first people to say hello or aloha were the housekeeping staff. We were almost to our room when we were greeted by every housekeeper we passed. It was so very disappointing. I’m still shaking my head. The suite I booked was not the suite I received. I booked a room by the waterfall. Our room was on the opposite side of the hall directly across from the outside restroom, not the waterfall. The food was disappointing as well. Several items were pre made. Kraft macaroni and cheese, Costco chips, salsa and guacamole and crab cakes made with artificial crab were among the most disappointing things we ordered. We did have a lovely fresh delicious breakfast buffet Sunday morning. The clerk in the gift shop was very friendly. She asked how our stay was going and I told her not well. She apologized and was very nice. On the first night of our stay when I connected to the internet a survey popped up. “How is your stay going so far?” I responded with a similar review that I’m writing now. I began with... I am a current guest. I did not receive a response. I’m still shocked by how our trip was. I always stay at the Orchid and recommend the hotel to family and business associates. My next trip however won’t be at the Orchid and I doubt that matters to them at all. A relief to have a luxury vacation without the crowds. I love the property, however there was a large financial conference at the time we stayed. This was not disclosed to us when we booked the hotel stay. There were numerous parts of the hotel unavailable to use because of &quot;private events&quot;. My kids got kicked off the beach one day due to this. We were unable to use the pool at times. There was also a lot of noise during the evening due to their private parties. I wish this was disclosed to me prior to my stay. Fantastic - great room with lanai view of the pool and ocean, great service in every department, beautiful grounds, nice running trails. Room was nice and all of our requests were met (crib, quiet room, facing south or east, fridge for baby's milk, etc.). The only thing that was disappointing was that the original concierge said we could get a later checkout of 2 or 3pm due to baby's nap schedule, but then the concierge the morning of our last day said we needed to be out by 1pm. The inconsistency with answers was frustrating. Very enjoyable hotel and a pleasant stay Bathroom needs maintenance as water from shower always spills onto floor through gap between door and bottom, and left sink doesn’t drain. Always love my stays with you. I gave a 9 out of 10 because I think you could improve the quality of food and beverage. I would like to see more organic options for food (i.e real maple syrup for the breakfast and free range eggs) And with beverages it would be nice to have alternate sweetness like stevia for sodas instead of High Fructose Corn Syrup. All in all, my stay was wonderful, but food options are becoming more and more important to the guest at your hotel. Go check out The Bohdi Tree down the street. its vegetarian which I am not but will always go there for a salad or smoothie because they use all organic ingredients. Everything start to finish about our stay at this hotel was wonderful. Friendly, attentive service, a huge, impeccable suite, delicious food, fun pool, nicely maintained grounds, and a wide variety of activities to keep the adults and kids happy. Everyone had a blast at the little beach and it was fun to venture out and snorkel beyond the protected cove. We will definitely be back! We stayed on the gold floor which was a fabulous experience and has spoiled me for Fairmonts that don't have gold floors. The staff was very welcome and attentive. The hotel grounds were lovely and well kept up. The complimentary activities like the petroglyph walk and storytelling were well done. The gym was pretty good for a hotel gym. The shuttle was very convenient. Overall, a great stay, and we'll be back! Liked the resort and its staff. Super 'chill' vibe which was great. Suggest you invest in an adults only pool which would be most welcome for those either without or with older children. Regarding the 'detail' - some decor seemed a bit 'tired' and in need of freshening up. Concierge staff missed a critical check in time for an off property event that we missed as a result. Fabulous vacation at the Fairmont Orchid! We had a wonderful time at The Fairmont Orchid. Great breakfasts, wonderful lounging at the pool with great help. The work out facility was wonderful as was the tennis pavilion. We enjoyed snorkeling and kayaking down at the beach. Housekeeping was fantastic and the rooms were very comfortable. A great place to relax and enjoy! Beautiful resort in a beautiful location with excellent service. Exceptionally wonderful experience. If there was an issue or small comment/feedback, the staff always tries to find a solution. Right when you arrive at the Fairmont Orchid, you are greeted with smiles and a beautiful view. The Fairmont staff were great to support your needs as a guest to their hotel. The property and landscape had views on views. I really enjoyed the garden view, the heated pool, the private sand beach for some water activities - snorkeling - and the amenities around the property. There were a lot of postcard moments on the property, like sunrise paddle board yoga, high noon sun tanning poolside & Snorkeling with turtles & fishes, evening pacific ocean waves sunset, and night time stargazing while swimming in the heat pool. This hotel was great for families & couples experience. I would do this again in a heartbeat. One of our best hotel stays ever!